Finding ways to specialize an accounting degree in acquisitions and mergers can be the first step to finding a position in a rewarding area of the accounting field. From completing the calculations to determine purchase price of a company or organization to compiling the reports needed for required financial disclosure, accountants who specialize in acquisitions and mergers are an integral part of that process. To begin to build the qualifications required to become an acquisitions and mergers accountant at most companies, a minimum of a bachelor’s degree in accounting will be required. An undergraduate degree begins with general education courses to gain a well-rounded base of education and knowledge. 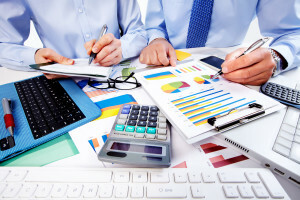 From there, major course work in an undergraduate accounting program include cost accounting, business finance, principles of accounting, and statistics. An option for choosing a concentration in an undergraduate accounting degree program to help in pursuing future positions in acquisitions and mergers accounting is the bank and finance specialization. Examples of courses that might be completed for this concentration option include principles of banking, financial literacy, strategic planning, and principles of financial services. Many graduate students pursuing a future career in acquisitions and mergers will start by enrolling in a master’s of accounting program. Core course work in this degree program will likely include classes in financial accounting, introduction to finance, decision making and data analysis, quantitative skills, and ethics and responsibility in business. In addition to completing core courses in a degree program for a master’s in accounting, future acquisitions and mergers professionals will look for a program offering a specialization in that field. Courses often included in a specialization for acquisitions and mergers include corporate strategy, negotiation strategy, post-merger integration, and advanced financial reporting. Other options include choosing a graduate degree in business administration with an emphasis on accounting. Students will complete classes such as taxation, financial accounting, auditing, and forensic accounting. Like the specializations available in master’s in accounting degrees, concentrations can also be chosen in some graduate business administration degree programs to complete courses specifically related to acquisitions and mergers. Whatever degree option a future professional chooses, additional training can be beneficial for adding to a list of credentials. The Alliance of Merger and Acquisition Advisors professional association offers training and certification for the Certified Merger and Acquisition Advisor designation. This professional certification denotes a professional who has knowledge and skill in various areas such as understanding trends and best practices in the acquisitions and mergers area of business. An interest in being a part of the combination of organizations to build larger firms and other similar business practices leads future professionals to begin to build the required skill set to become a part of this field. Tailoring options to specialize an accounting degree in acquisitions and mergers will help prospective candidates gain the requirements that will be needed.